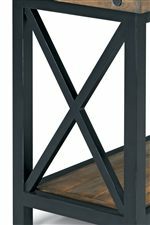 Perfect for behind a sofa, an entryway or a hallway, this sofa table brings a simple, industrial style to your home. 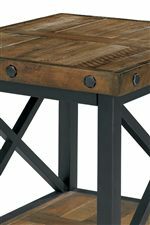 The reclaimed wood top boasts beautiful planks while the metal base, X sides and legs have an industrial feel with an aged, oiled steel look. The table edge has large exposed bolt heads to complete the look. Contemporary in style with a rustic feel, this sofa table is a stylish addition to your home. The Carpenter Sofa Table with Rectangle Wood Plank Top and 1 Shelf by Flexsteel at AHFA in the area. Product availability may vary. Contact us for the most current availability on this product.